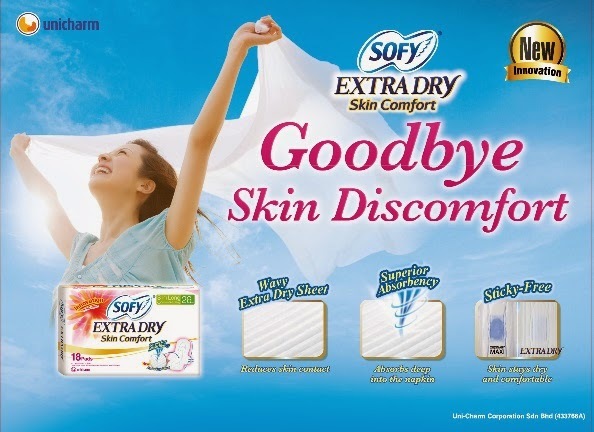 Superior Absorbency: The Extra Dry Sheet allows liquid to be absorbed quickly into the napkin. This program is open to all Malaysians, except employees & immediate families of Uni-charm Corporation Sdn Bhd and related advertising agencies. Kindly submit this form no later than 31st May 2015. Entries submitted after the closing date will not be valid. Only ONE entry is allowed per customer, per NAME, per household address during Campaign period. Uni-charm Corporation Sdn Bhd reserves the right to replace the prizes with products of similar value without prior notice. Uni-charm Corporation Sdn Bhd reserves the right to vary the terms & conditions of this campaign without prior notice. Uni-charm Corporation Sdn Bhd reserves the rights to the final decision and no further correspondences will be entertained. By participating in this program, participants agree to be bound by the official Rules and Regulations and decisions of Uni-charm Corporation Sdn Bhd. By taking part in this program, you understand and accept without condition that Uni-Charm Corporation Sdn Bhd may elect to use your personal information contained herein for internal and/or external marketing purposes in a manner it deems fit, whilst according your privacy or confidentiality with the highest priority.